It’s commonly known that each person has a unique thumbprint. But what about your particular health challenges? At LEVA Chiropractic, we believe they can’t be compared to anyone else’s and require the solutions that will work just for you. To understand your specific situation and what will be most effective in getting you results, we’ll perform a thorough examination. 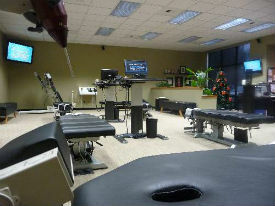 Once completed, we’ll use the chiropractic adjustment to make the necessary corrections. We may give you advice such as home care to make more progress. After just a handful of visits, most of our patients see dramatic effects. After experiencing his own health challenges, Dr. Sweet couldn’t find answers anywhere. For that reason, we don’t just do our best to solve your problems — we look outside the box and everywhere else possible to get you answers. Tough cases are welcome, and we’ve seen people who thought there was no hope left achieve incredible results from Atlas adjustments. It’s so light that you won’t even feel it. But when this bone is moved into alignment, the body’s recuperative abilities are kick-started. All ages can experience the benefits of chiropractic, from babies to those in their 90s. When we see newborns, we use the pressure of a pinky to correct a subluxation. Instrument adjustments are often best for a child. Even if you’ve been told you can never see a chiropractor due to a spinal fusion issue, we would love the chance to evaluate your health and see if we can help. Contact our Lacey office today to get started! Same-day appointments are available.